I'm a little late to the party on this one, but I finally got around on Saturday to seeing a movie I had been anticipating and hearing so many good things about, particularly in the BirthMovieDeath site. 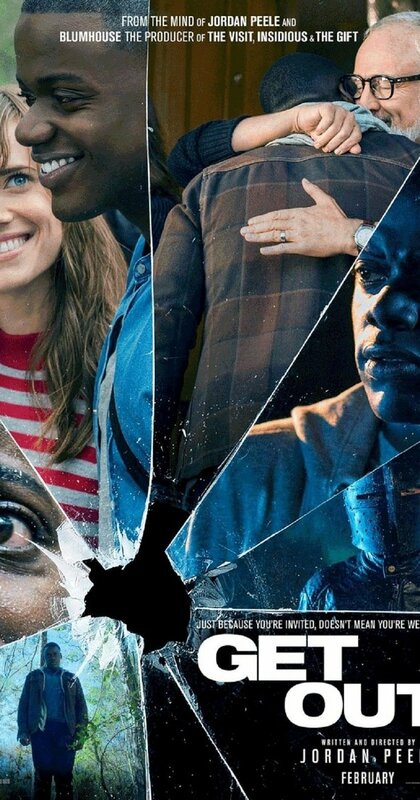 That movie is Get Out. Usually, when you see a movie that has been as hyped up as this one, you can't help but end up a little disappointed in the end. Not this time. The movie was amazing. It's a simple enough premise that has been the basis of countless stories. A man goes to a strange house. Weird things go down. 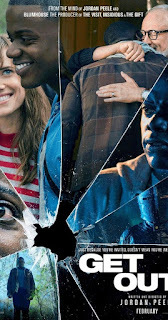 But writer and director Jordan Peele deftly weaves racial politics into it, like Guess Who's Coming to Dinner but with horror trappings instead of a comedy, as Chris (Daniel Kaluuya) goes to visit his white girlfriend's (Allison Williams) family out in the country. He asks if she has told them that he is a black man and she assures him that it doesn't matter to her or her parents. But when he gets there, Chris can't help but feel that something is amiss even though her parents, the Armitages (played by Catherine Keener and Bradley Whitford), are incredibly accepting of him and even offer to hypnotize him to help him quit smoking. Then things get weirder from there. To go any deeper into it would spoil some of the great surprises that the movie has. Truly, it keeps you on your toes and often disarms you with humor right before throwing you right back into the breach. The film's tone brings to mind some of the films of the 70s, in particular Let's Scare Jessica to Death, with its own lead character questioning whether the things she sees are real or a figment of her own imagination. Indeed, Chris has his hands full trying to figure out the same as he tries to get through a weekend at the Armitage house. Martin, by George A. Romero, is also brought to mind. That's no surprise as both films wear their social commentary on their sleeves and use it to weave a tale that engrosses and shocks and is utterly enjoyable. Get Out is an exciting new entry into the horror genre from a director I can't wait to see more from. Jordan Peele has switched from comedy to horror on a dime and his work sets a new bar for those making their own debuts. If you haven't seen the movie yet, definitely check it out. You will be glad you did.